A petting zoo can be a fun and profitable business opportunity for animal lovers. Be sure to take out any licenses or permits required by federal, state, or local government agencies. It is wise to begin by researching requirements with the Department of Agriculture, local zoning boards, and local licensing boards before setting out to develop a petting zoo in any particular locale. It is critical that your business has a liability insurance policy to protect against injury claims from park visitors. Animals can be unpredictable, and even the most docile animal can strike out when it feels threatened. Liability insurance will protect you and your park against lawsuits. A petting zoo generally requires the use of ten acres (or more) for proper planning. The more animals you plan to have, the more room you will need. You should locate your petting zoo within a reasonable driving distance from a city or large town to generate sufficient customer traffic. Extremely rural petting zoos will usually not generate enough revenue to stay in business. Petting zoos may include a wide variety of animals. Common choices include horses, ponies, sheep, goats, cows, donkeys, deer, alpacas, giant tortoises, pot-bellied pigs, rabbits, guinea pigs, chickens, ducks, and geese. Larger animals will need to be separated from guests behind fences, and they will require close monitoring when interactions take place. Some petting farms also feature free flight aviaries (where tropical birds interact with guests) and fish ponds with koi. Animals should be purchased from reputable breeders, farms, or other petting zoos. It is important to give each animal time to adjust to their new surroundings, and to be sure that the animals selected for the zoo are reasonably well mannered and tolerant of the attention they will be receiving. 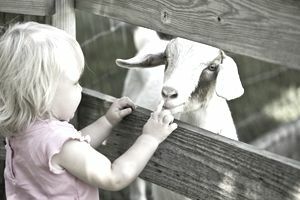 A petting zoo should be safely enclosed with a network of fences and gates to prevent animal escapes. Areas that are off-limits to the public should be clearly marked. Rules for visitor conduct and safety should also be clearly posted on signs near each animal enclosure. The facilities for the animals should include both display areas (where animals can interact with visitors) and areas that are restricted from public access. It is also important to have areas where you can quarantine any sick animals or those about to give birth. Adequate shade is another important feature for both the animals and the patrons of the zoo. The facilities for visitors should include a concessions area, bathroom facility, safe paths for walking between exhibits, paved or gravel parking areas, and seating areas. Golf carts, trucks, trailers, and farm equipment will be necessary to move animals and supplies. Larger parks often offer train rides around the park. Depending on the scale of your operation, you may need to hire additional full or part-time staff to clean up after the animals, give food and water, sell tickets or concessions, operate the gift shop, perform general park maintenance, and supervise guests as they interact with the animals. Most petting zoos are run as a family business or with hired help—they are rarely a one-person endeavor. It is not necessary to have a veterinarian on site but you should contract with a local vet to provide care for your animals when necessary. The cost of admission may vary based on the size of the petting zoo and what is offered, but in general, the cost of daily admission will range from $8 to $15 per person. There may be additional fees for animal feed, pony rides, train rides, or other activities. Discounts are frequently offered for days with less visitor traffic (like Mondays and Tuesdays). It is important to market a petting zoo to the target audience: children and their parents. Schools, daycares, scouting groups, and other such groups may also be interested in taking their students on field trips to your location. The best places to spend your advertising dollars will be local newspapers and magazines. Online ads also are a great way to get the word out about your business. Another way to advertise is to create a webpage with all the relevant details about the petting zoo including hours, cost, and any additional activities that might be available (such as birthday parties on site or bringing animals to a client’s party location). A newsletter or printable coupons should also generate interest. You should also consider donating tickets to charities or offer a discounted rate to large school groups to generate patron traffic.